There are different types of electric lamps , but the most popular of these lamps are the fluorescent lamps and the light bulbs , The fluorescent lamps are type of lighting lamps known as neon lamps , but the inert neon gas is not used inside its the glass tube . 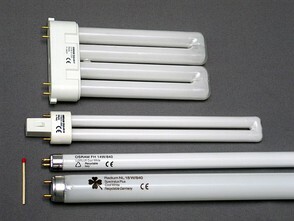 The fluorescent lamps are used in lighting the houses , the shops , the offices and the underground metro . They are used in decorating the commercial stores . They are used in the commercial advertisements . A glass tube which is a vacuumed glass tube that contains inert argon gas and a little of mercury , The inner surface of the glass tube is covered with a phosphoric material . Two filaments of tungsten which are found at the two tips of the lamp from inside , where each tip contains a filament of tungsten . Two points of connections at each tip of the lamp , They connect the fluorescent lamp to the electricity . They are a type of the fluorescent lamps that consume the electric current less than the light bulbs , They stay longer than the ordinary electric bulbs from 8 to 18 times , Their working time is from 8000 to 15000 hours , while the working time of the light bulbs are from 750 to 1000 hours .